This piece is about the years I served as a literacy volunteer with Read to a Child, a national organization that empowers office professionals to act on what science has proven: that reading aloud to a child is a surefire way to brighten a future. Founded in 1991 and formerly called PowerLunch, this program allowed me to forge lasting bonds with two elementary schoolers in a challenged South Boston neighborhood. All while traipsing about our imaginations, pouring over the pages of a book. My former employer, Cengage Learning, did the admirable work of sponsoring Read to a Child and provided transportation to and from our office so I could be there for Sarah and Natalie—names have been changed—at the appointed time each week. For this I forgive them for laying me off in 2013. An elementary school library. Lunchtime. Two girls—one little now and one little long ago—peer into an open book on the table before them. The grown-up—that’s me—reads a rather dreary story aloud. “Hey! Lynne!” the young voice erupts and stops the scene cold. “Yes?” I raise my index finger. One. “Know what vampires say when they order pizza?” The little girl’s fingers pop into the universal sign for telephone. “Really? How do you know?” I ask. “Because I live with one,” she answers. I drop an elbow onto the table and sink my chin into my upturned palm. My eyes narrow. The little girl’s eyes shine and hold my gaze. Her eyebrows lift and a smile she is fiercely resisting tugs at her lips. Guilt, or at least self-consciousness, creeps into her expression. Her fine hair is in its usual tight ponytail, on her nose a spray of honey-colored freckles. It’s a routine work Thursday, lunchtime, and I’m in a standoff with a third grader with a penchant for telling tall tales. The setting is a Boston Public Schools library. A half-eaten disc of pockmarked hamburger sits in the black plastic tray before us. The bun is still sealed in plastic. Untouched limp green beans await the trashcan. The chocolate milk is nearly gone, as is the banana. The partial consumption of the latter required a sophisticated series of bribes. The little girl is a formidable negotiator. She hunches over the tabletop in the orange plastic chair, squirming on scabby knees. We size each other up silently, like gunslingers in the Old West. But I can’t hold it in. My sigh turns to giggle, and though she barely registers victory, the little girl is deeply satisfied. Oh well, I think. And again I put off delivering my prepared remarks on truth-telling. We pull the book closer and resume the frightful tale of the Baudelaire kids from Lemony Snicket’s The Bad Beginning. Violet, Klaus, and Sunny are a luckless trio who lose their parents in a fire and are forced to go live with an evil relative intent on stealing their inheritance. It was the kids’ preparation of puttanesca sauce that prompted a discussion of olives and capers and garlic, which led to Nat’s imagining of Dracula on the phone to Domino’s. When creepy Count Olav appears to be angling to marry his adolescent niece, Natalie puts her head down on the graffitied table, and even I start to lose patience. And in fact, when I show up the following Thursday, Natalie rushes over to our table flushed with anticipation. ..She plops down in her seat and grips the milk carton. Her nails are painted with neon highlighter. “Nothing good ever happens to those kids,” she declares. I don’t often encourage the hasty abandonment of books, but I see her point. “Let’s try Judy Moody?” she grins and shrugs. “You’re in charge,” I say. It’s not the whole truth, but I know she likes thinking it is when she can get away with it. So I follow her to the fiction shelves. The James F. Condon school is on D Street in South Boston—Southie—adjacent to the 727-unit West Broadway housing project that opened in 1949. It’s a hulking concrete building, grey with blue trim, surrounded by a grey plaza and sidewalks. We volunteers alight from the white van that ferries us from our hushed office. We ring the bell and await the buzzing that tells us we can pull on the big silver handles. The first thing you notice is the smell. It’s lunchtime, after all. An odor clings to and blankets the air. It passes as food, but the nose knows there’s more to that story. The smell resides far from fresh and wholesome on the olfactory spectrum. The second thing you notice is the noise and the energy. The school’s greatest asset by far is the burbling, bubbling river of life that flows up and down its central staircase and across its speckled grey floors. Classrooms are on the move. A miniature, unruly army clad in the colors of the school uniform: blue, khaki, white. Limbs flail, laughter erupts, hands are sought and held, allegiances made and broken. Feet pace and pound the ground. Adult voices alternately play along and plead for order. We sign in at the front desk—L. Blaszak, 12:55pm, Library—then pick up our nametags and climb the stairs. In the library we collect our folders and take a seat, each at a different table. Soon Natalie hurries in, ponytail swinging. Her blue eyes shyly scan the room, brighten and widen when she sees me. I wave animatedly. Then she turns toward the red crates of food, makes her selections, and hurries over. “What’s new?” I usually ask. She used to say “Nothing,” but now she knows there’s no use. If she doesn’t come up with something, I will mine the preceding week for her own stories before we open and enliven the ones printed and bound. Lately she comes prepared. I joined the PowerLunch program in early 2009. (A few years later, the program name changed to Read to a Child.) I read weekly with a student named Sarah for part of her third and all of her fourth grade year. She was a quiet brunette with a turbulent home life, often dwarfed by the adult XXL sweatshirts that she wore to school. 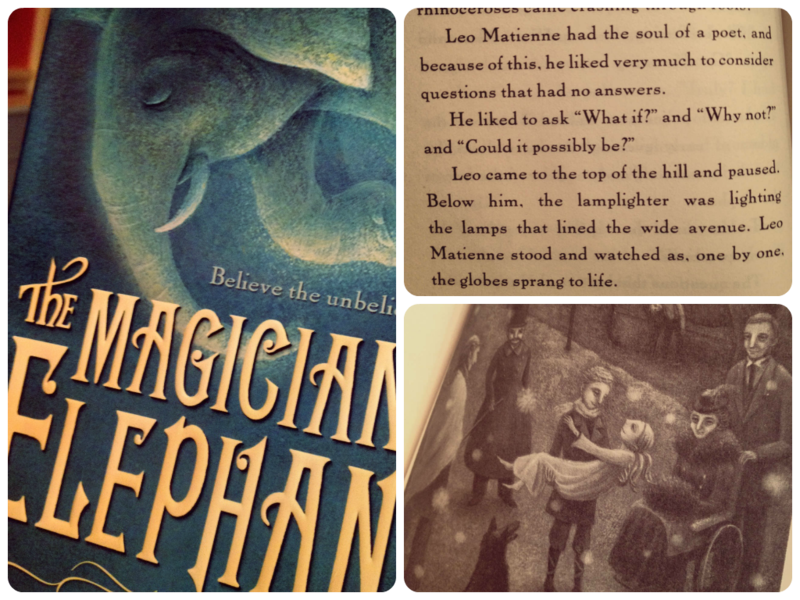 I wanted to make the time count and possibly discover a new favorite, so I scoured the latest reviews and excitedly purchased Kate’s DiCamillo’s acclaimed book The Magician’s Elephant. As we got into it, I worried that the plot was too subtle, that there wasn’t enough context to which Sarah could relate. The characters’ names were foreign and hard to recall; it was set in nineteenth century Central Europe, in an imaginary town with a cathedral and a countess. The simple sentences and ardent tone seemed high risk for holding attention. Was she finding it boring, or worse, lame? Sometimes she didn’t really seem like she was listening. Despite my purchase, I would have gladly discarded it for something else. We used a pencil to circle new vocabulary words and wrote synonyms in the margins. Once I’d convinced her it was okay, it was thrilling to write in a book. We underlined and starred the major plot points. Each time a new character was introduced, we flipped to the front papers and recorded the name. As personal details and histories and connections were revealed, we recorded those, too. Our months-long journey was manifest all through that book, and at the end of the year she took it home. My favorite thing about Sarah was that, while the rest of her remained still, her brown eyes opened just a smidge wider when she was truly challenged or enthralled by something. Perhaps I cherished that because otherwise she could be rather stoic. Many weeks her eyes didn’t alight at all; often she seemed tired or preoccupied. thank you so much for sharing all your lunchtime stories with us! I absolutely love the initiative “Reading with Children” and as I said before, I’m going to write about them (and the German pendant). Your part in this is very important and it’s good to read that there are people like you out there. And of course it is good to read that your reading partners cherish your help and time. It is cool to follow up how Nat evolves and how creative and bright she is. I hope you’ll have many, many more lunch hours to spend by reading with children.